Astronomers have combined telescope data to examine how the double whammy of a supermassive black hole alongside colliding galaxy clusters can create a cosmic particle accelerator. The Chandra X-Ray Observatory captured an image of the colliding galaxy clusters called Abell 3411 and Abell 3412 which was then used alongside other telescopes to determine how its merger with a giant black hole can result in a “stupendous cosmic particle accelerator”. The two giant colliding clusters weigh about a quadrillion times the mass of the Sun and are located about two billion light years from Earth, according to NASA. “We have seen each of these spectacular phenomena separately in many places," said Reinout van Weeren of the Harvard-Smithsonian Center for Astrophysics (CfA) in Cambridge, Massachusetts who led the study. "This is the first time, however, that we seen them clearly linked together in the same system," he said. Optical data detected at least one spinning supermassive black hole which produced a “rotating, tightly-wound magnetic funnel” in one of the galaxy clusters. The powerful electromagnetic fields associated with this quickly shifted some of the gas away from the area of the black hole in the form of an energetic, high-speed jet. 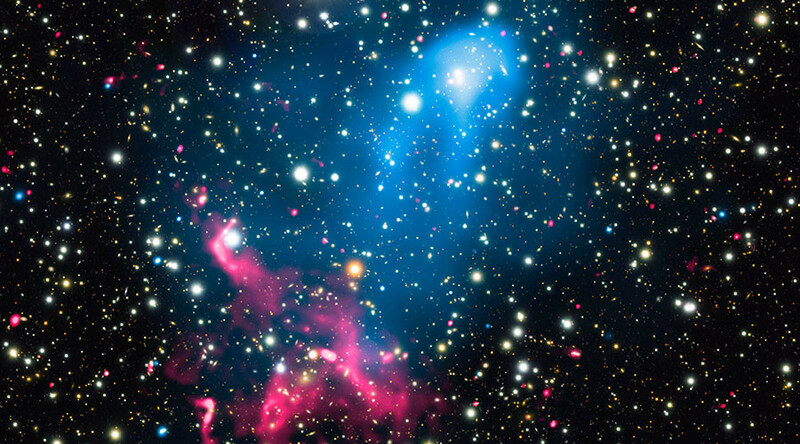 These particles were accelerated again when they were hit with colossal shock waves produced by the collision of the massive gas clouds associated with the galaxy clusters. "It's almost like launching a rocket into low-Earth orbit and then getting shot out of the Solar System by a second rocket blast," said co-author Felipe Andrade-Santos, also of the CfA. "These particles are among the most energetic particles observed in the Universe, thanks to the double injection of energy." The team concluded that as the shock waves travel across the cluster for hundreds of millions of years, the doubly accelerated particles produce giant swirls of radio emission. The research was presented at the 229th meeting of the American Astronomical Society meeting in Grapevine, Texas along with another exciting discovery from the Chandra X-ray Observatory. The Chandra produced the deepest X-ray image ever obtained to reveal a spectacular insight into the growth of black holes over billions of years. The X-ray image contains objects at a distance of nearly 13 billion light years and was created after more than 7 million seconds, or eleven and a half weeks, of Chandra observing time. 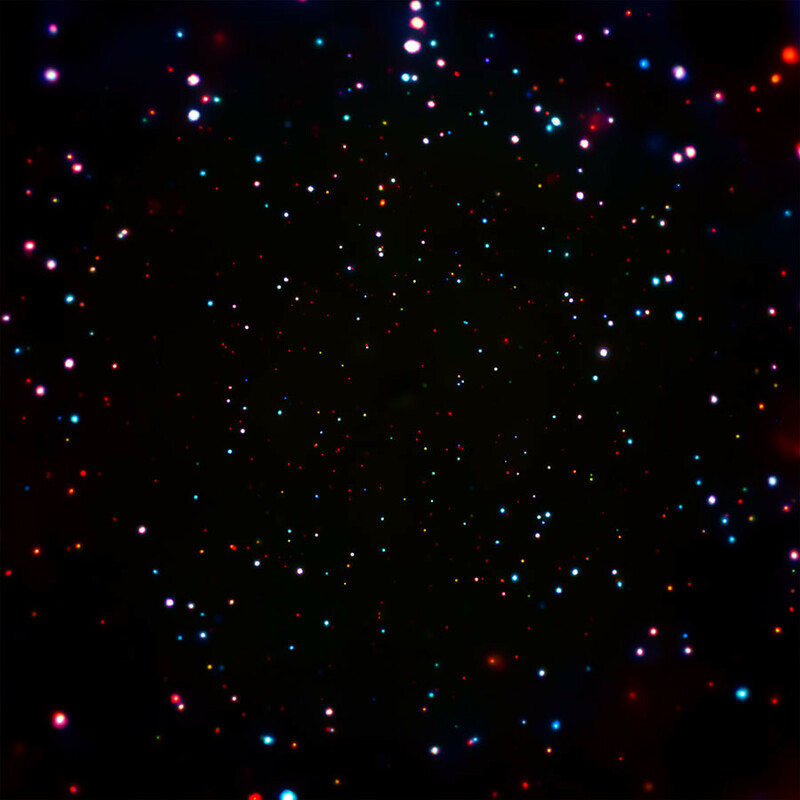 The low, medium, and high-energy X-rays that Chandra detects in the above image are shown in red, green, and blue respectively. Meanwhile the central region of the image contains the highest concentration of supermassive black holes ever seen. Astronomers say it is equivalent to some 5,000 objects on the full moon or a billion objects across the entire sky.